Smells like Mario Spirit …Genzoman mixes the popular Nirvana Album Cover with Yoshi’s Island! GENZOMAN aka Gonzalo Ordóñez Arias from Chile is one of the most popular artists of today and worked for many video game companies and UDON. In his free time he still draws fan art of his favourite games whenever he has the time for it, and created a duo of Street Fighter X Final Fantasy mixes already. 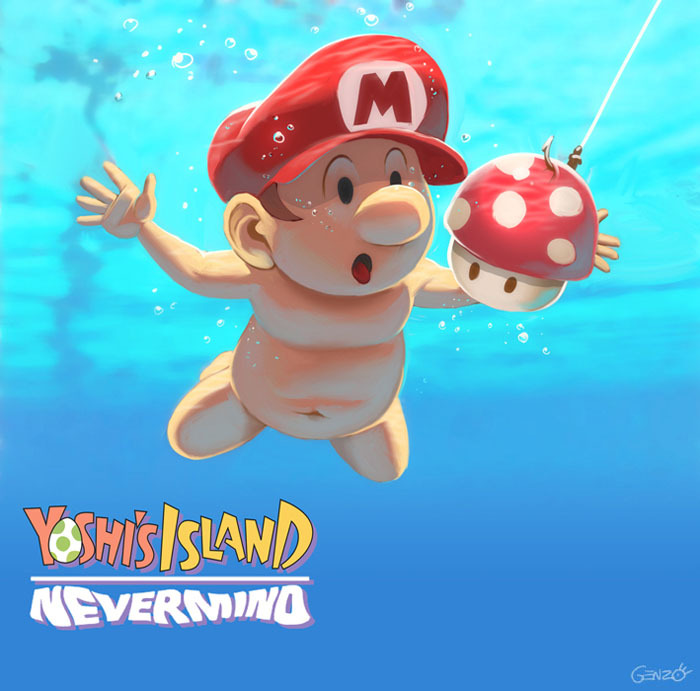 Now he made this parody / different take on the famous Nirvana Nevermind album and replaced the baby and the dollar note with baby Mario from Yoshi’s Island and a 1UP Mushroom. If this is not simply awesome I really don’t know! Kudos to Gonzalo!